Email Finder 4.1.5 - Download Win Apps. Extracts emails from internet through search engines as google, bing, yahoo etc..
EF extracts email address from Websites/URLs on internet & through popular search engines like (Bing, Google, Askcom, Yahoo, Lycos, Altavista etc). It extracts 10000's of email address from web-page with various criteria of searching and gives a email address list you actually need. 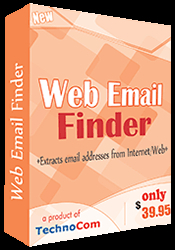 In comparison to Email Finder offers you a good chance of extracting e-mail addresses from web sites, clipboard or local files. Extract all email addresses from Microsoft Outlook. Automatically gathers contact e-mail addresses from every web site visited. Robot will help you avoid sending out newsletters to invalid addresses. Otherwise you'll get tons of bounced messages. It's not a secret that ISP mail servers can block senders' IP for recurring sending to invalid email addresses.